In his own words Pepys gives a frank picture of the intrigues and affairs (including his own) of the 1660's, wrestling with his conscience - and sometimes his wife - as he follows the drama, on and offstage, of the Restoration playhouse in the age of plague, fire…and Nell Gwyn! A lively and informative performance in costume, devised and presented by Colin Pinney. Samuel Pepys was an eyewitness to numerous great events of his day, including the Restoration of King Charles II, the Great Plague of 1665, and the Great Fire of London in 1666. He chronicled all these events for about a decade in a day-to-day diary that is considered one of the greatest historical records and journals in the English language. 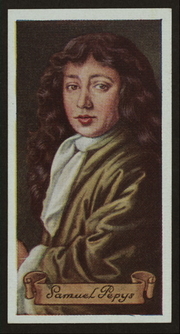 Samuel Pepys is currently considered a "single author." If one or more works are by a distinct, homonymous authors, go ahead and split the author. Samuel Pepys is composed of 12 names. You can examine and separate out names.